Setting up the ideal habitat for a hermit crab is important for keeping your little friends happy and healthy. It’s not enough to have them in a secure container, you need to ensure that there is enough space, heat, and humidity to go around and that you are fulfilling their intrinsic need to dig, burrow, and climb effectively. The way you setup your crabs habitat can literally mean the difference between life and death, so it’s important that you get it right from the beginning. Here is our guide for setting up the perfect hermit crab habitat. The minimum tank size recommended for a small group of hermit crabs is 10 US gallons. This will comfortably fit up to 6 small crabs or 4 medium-sized crabs. You can choose either glass or plastic as the building material, but glass is preferred because it traps humidity into the enclosure more efficiently. Wire cages cannot trap humidity and should never be used as a permanent cage solution. Additionally, most commercial hermit crab enclosures are too small to support multiple hermit crabs while leaving room for molting, feeding, and enrichment. Sand is the most recommended substrate for hermit crabs because it is light enough to support digging and burrowing while being fairly inexpensive. Some people choose to mix sand with coconut fiber for increased moisture absorption or soil to best replicate their natural environment. You can find coconut fiber and pet-safe soil at most local pet stores. You might want to consider sterilizing substrate before placing it in the hermit crab enclosure to reduce the risk of parasites or other debris entering the tank. You can sterilize most substrate by baking it in the oven at 300°F for 30 minutes. 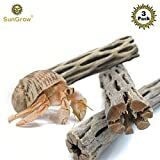 If your room has a lot of natural lighting, you shouldn’t need to worry about having a designated light in your hermit crabs tank. 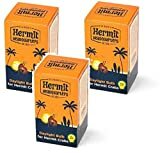 As long as there is a sufficient day-night cycle available, your hermit crabs will live happy lives. However, if the room doesn’t have natural lighting available, adding a light might not be the worst idea. If you want lighting that won’t increase the temperature of your crabs habitat, look for fluorescent, CFL, UVB, or white LED bulbs. If you do need to add some heat, you’ll want to use incandescent, a specialty reptile heating bulb, or UVB CFL bulbs that include a heating element. The ideal lighting cycle for a hermit crab is 8 – 12 hours of daytime and 8 – 12 hours of nighttime. The ideal temperature range for a hermit crab is between 72°F and 80°F. If their habitat doesn’t reach this range, they will gradually become weaker, stressed out, and more susceptible to illness. You can use under tank heaters, heat lamps, or a combination of both to achieve the perfect temperature for your hermit crabs. It’s recommended that you monitor the temperature daily to ensure that it remains consistent. Along with heating, humidity is a very important feature in a hermit crab’s habitat. Hermit crabs rely on humidity to breathe and will begin to suffocate if their habitat is too dry. The correct range for relative humidity is 70% to 80% and should be monitored using a hygrometer, a tool for measuring humidity levels. To properly control humidity levels, it’s important to have a solid lid covering the habitat. It needs to be solid because mesh lids will let out too much moisture. If the habitat is too dry, you can try soaking natural sea sponges with dechlorinated hot water and storing them in the tank or through gentle misting using a spray bottle filled with dechlorinated water. VALUE PACK: 5 unbleached sponges measuring 1.5-2" when wet. Hermit crabs are omnivores and natural scavengers, so their diet isn’t overly picky. You can expect your hermit crabs to enjoy fruits, vegetables, insects, and unseasoned pieces of meat. Hermit crabs should have access to food within their habitat, but any fresh or moist food should be monitored for signs of mold and replaced daily. Most processed food contains too much sugar and salt to be offered to your hermit crabs regularly. Instead, feed high-quality hermit crab food, vegetables, meat, and fruit in moderation. Hermit crabs should have 24/7 access to bowls of water for bathing and drinking. In one bowl, you should have fresh dechlorinated water and in the second bowl, dechlorinated saltwater should be available. Always make sure that your hermit crabs can get in and out of the bowls on their own to avoid accidental drownings. The most important accessories to keep in your hermit crabs habitat are appropriately sized water bowls, food bowls, empty shells, and something to climb. The water bowls are for the dechlorinated fresh and saltwater for independent bathing and drinking. As mentioned in the previous section, they need to be appropriately sized for your hermit crabs to enter and leave as they please, otherwise you will risk accidental drowning. There should be multiple food bowls to ensure all of your hermit crabs eat enough food and don’t feel too crowded by their tank mates during meal times. Empty shells that are bigger than your hermit crabs are important because they do not grow their own shells after molting and will need a larger home once molting is completed. Painted shells are not recommended because hermit crabs are known to chew the paint off of them, and they could have a toxic reaction. Hermit crabs are active and like having places to climb and explore. You can offer this by keeping pieces of wood within the habitat. Always make sure the wood is untreated and has been properly sanitized prior to placing them with your hermit crabs. Spot cleaning daily is one of the best ways to keep your crabs habitat clean. Important daily jobs include replacing both water sources, and removing perishable food while being sure to wipe down dishes. It’s a good idea to do heavy duty habitat cleaning about twice per year dependent on the amount of hermit crabs you own. This time, you should remove the hermit crabs from the habitat and thoroughly clean the walls of the tank, filtering sand for debris and sanitizing if necessary. Larger aquarium decorations can be sanitized using hot dechlorinated water and replaced as needed. Commercial cleaning products should never be used to clean your hermit crabs habitat. Consider using a diluted bleach solution or diluted vinegar instead, being sure to rinse the tank and accessories well to remove all traces of bleach.